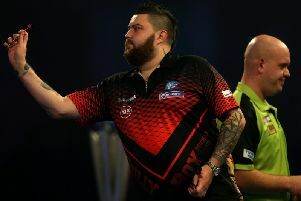 Michael Smith's debut in the Betway Premier Darts League is turning into a nightmare. The 25-year-old local lad is still searching for his first win - suffering defeat number three at the hands of James Wade in Newcastle on Thursday night. Smith, who is anchored at the bottom of the table, missed far too many doubles during a 7-4 setback against 'The Machine' and will need to turn the corner quickly if he is to make the final cut. St Helens compatriot Dave Chisnall was also beaten by former world champion Adrian Lewis. Lewis started like a house on fire, storming into an early 6-1 but despite a fightback Chizzy eventually went under 7-4.